Like many people, I like to snack. I try to keep fruits and veggies within eyesight so I reach for those first, but some days I just want something sweet. Since I don't normally keep candies or prepackaged treats on hand, I usually have to make something from scratch. That means flipping through my recipe box until something strikes my fancy. Lately though, I have been turning to Golden Blossom Honey to meet most of my recipe needs. 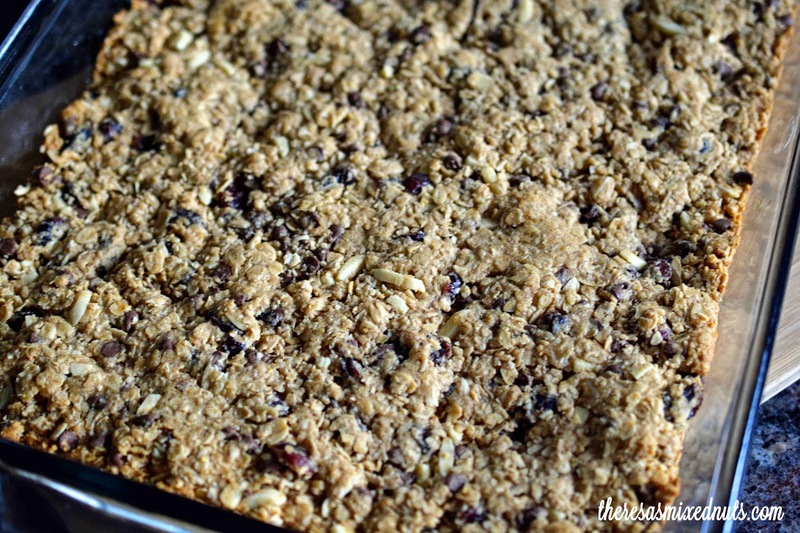 Last month I came across their Trail Mix Bars recipe and thought it would be a great one, not only to satisfy my sweet tooth, but it would be perfect to pack in my husband and daughter's lunches as well. They are now a family favorite, so we have made these bars several times since then. My youngest daughter thinks they are a real treat because she says they taste just like an oatmeal cookie. Made with oats, dried cranberries, raisins, almonds and mini chocolate chips, they have everything I need to satisfy my sweet tooth craving, and give me a needed boost of energy in the afternoons! I'd say that's the perfect snack right there! What kind of fruits would you use to mix into your trail mix bars? I think they're the perfect snack as well! Yum. I've never thought about making something like this. Thanks for the recipe. As long as my trail mix has chocolate or butterscotch chips in it, I am a happy girl. Your recipe sounds awesome. I don't do trail mix without chocolate chips! Although dried cranberries are pretty good too. and that first photo is one of your best ever! I like making homemade Bars that are healthy like these and having them for breakfast. This looks easy to make and I bet they taste delicious. Thanks for sharing an awesome recipe! I love bars like this, but they're so expensive to buy at the store. Thanks so much for sharing these! They look awesome. I never tried making my own. I love recipes like this! The stuff you buy in the store is usually junk. My boys need a legit snack after they've done their ju-jitsu class. I've been making them a snack. I'll add this on the list of snacks to make. Those trail mix bars look great! They look so pretty with the background you used too! I would love to try making these some time! Thanks for sharing. These sound really tasty! I will have to try my hand at making them for myself. Beautiful pictures! Well done. I have never made these from scratch and I am wondering why. They look so easy to make. They are really easy to make. Once you make them, you won't want to go back to store bought. Wow these look amazing. I doubt mine would look as good! They look and sound super good! Those do look fantastic. I am going through a raspberry kick, so I'd love add some dried raspberries to mine. I would love to try making these. I would add dates and dried cranberries to mine. Those look delicious - way better than storebought! Those looks yummy! And probably much cheaper than the ones I pack in lunchboxes everyday! These look yummy and delicious. You could really mix it up and try all sorts of ingredients like nuts and coconut too. I put some kind of bar in hubby's lunch every single day (he eats it for a mid-morning snack). I bet he'd love if I made these... I might do it as a surprise and see if he calls home to note them (he does that when he particularly likes something in his lunch box). :) They look great to me! What a nice homemade healthy snack! I must try this for my kids! My aunt used to make these.... I need to see if I can make them like her. This will go with me everywhere as soon as I try out your recipe. thank you for including chocolate in them! 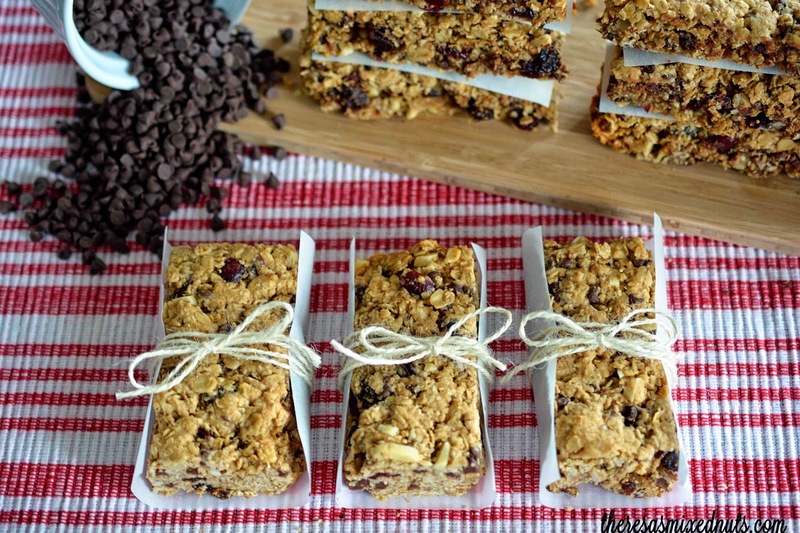 We love making our own fruit bars and trail mix bars. We can put what we want in them and dont have to worry about the junk companies put in their eats. Those look like a nice treat. I am sure my family would enjoy having those bars around the house to snack on. it looks easy to make..but I haven't tried it..love to buy the similar bars, but most of the time I find it too sweet.. Very nice job! The last time I tried making some granola bars, they all ended up in the garbage. Oh, these look great! I have been trying to make more of our snacks from scratch rather than buying prepackaged. I will definitely have to try these! This would be a great alternative to buying granola bars for my son to snack on. Nice and healthy and homemade! These look good! I'll have to try them! These looks so tasty and easy. Pinned to my Healthy Board. Yummy! I love trail mix bars. Dried cranberries are probably my favorite fruit to include. What a great idea. I need to try making this. I want a snack to take in the car with us when we are busy running errands with the kids. Mmmm, those look so good! Not to mention that they're perfect for everyone in the house to just grab & go. This is such an awesome idea! I will be making these for my next road trip. It's always nice to have healthy snacks on hand. These look amazing. I would probably try blueberries in mine. I think they go well with just about anything. Thank you for sharing this recipe. I would love to make these for a healthy snack to take with me on the go. These look so wonderful. I've been itching to try and make homemade granola bars lately rather than store bought due to the preservatives. These are so much better than store bought. I will have to try your recipe. I love to snack as well! THese would be perfect to take to work or to eat on the go! Yummy! These would be great for snacking on during long car rides!